I got back home today, after being on the road for a few days during the Christmas holiday. One of the two December holidays are over anyway. Now I just gotta make it through New Years Eve alive as well and everything will be just excellent. The first thing I did when getting back today, was booting up my workstation and got working on a new female character. I’ve just spend about 2 hours so far, but blocked out most of her proportions, made some basic facial features and added some dummies as clothing placeholders. I’m pretty happy with the overall progress so far. I am going to need this girl for a project pretty soon, so I hopefully wont delay this one, so I’ll just take this opportunity and post this fist work in progress image, and get back to work. Overall proportions in place and first simple clothing added, so I can start detailing. I’ll tune her proportions some more, and add in all details to the clothing. And then finally give her face the appearance and features I want. 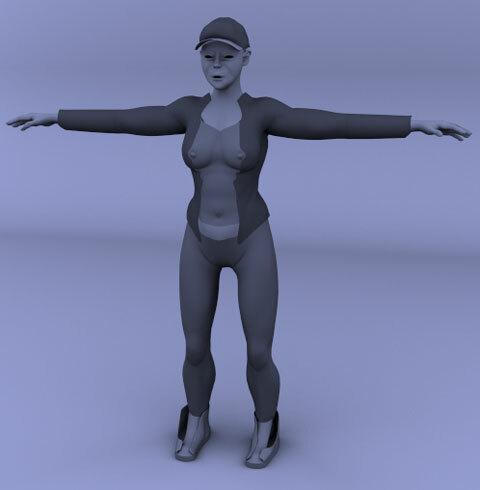 That should be the end of the modeling part me thinks and I can move on to texturing her. This is going to be some sort of 3D toon / semi-realistic style. At least that’s what I have in mind right now. Let’s see when the next update comes, soon.